Q. What are the differences between open and closed cell foam? In a nutshell: unless you’re insulating for sound, closed cell is the better product: it doesn’t absorb water (so no vapor barrier is needed), it adds strength and rigidity to the structure and it has a greater R-value per inch (which comes into play when the insulation cavity is shallow, i.e. 2×4 framing). So why would anyone choose open cell, you ask? Mainly for cutting costs. Both open and closed cell foam will form an air-tight seal. However, open cell has half the R-value per inch as compared to closed cell – roughly R-3.5/in to closed cell’s R-7/in. In order to get the same insulating value, open cell must be sprayed twice as thick as closed cell. Since current energy code mandates an R-21 minimum in wall cavities, open cell can only be used in 2×6 or deeper walls; by comparison closed cell can be sprayed in a 2×4 wall cavity and still satisfy the energy code. We understand – many topics bore us too (but not this one). However, moisture control is the most critical aspect of any building project. In the building trades there’s an old, simple saying: “water wins!” And this is absolutely true – from roofs to foundation walls, to insulation. If you’ve ever removed an old fiberglass batt only to find a wet, moldy surface behind (as often as we have), you’ll understand the importance of a vapor barrier. There’s always some amount of invisible moisture, or “vapor” in the air (think “bathroom after hot shower” for a visible example). 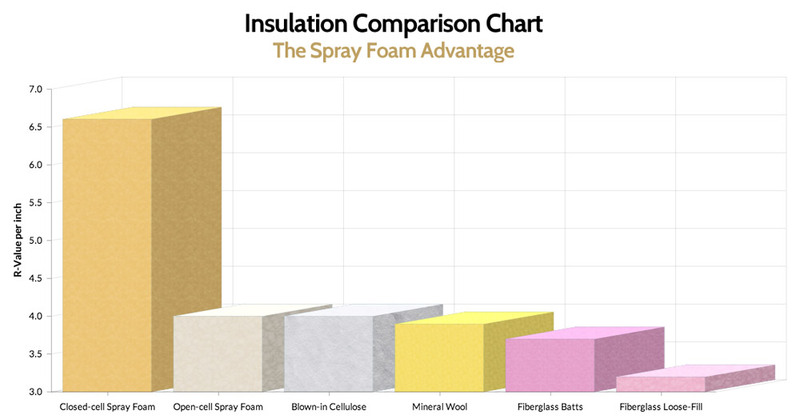 Closed cell foam does not absorb moisture, it will act as its own vapor barrier. Fiberglass and open cell foam, on the other hand, will let that vapor pass right through and condense on the cold surface behind the insulation. Voila! Wet walls, with rot and mold soon to follow. for a no hassle estimate and take a step toward energy efficiency and comfort!